Cats can fly on broomsticks, right? Well... maybe not, but the image sure makes a fun Halloween card for a cat lover. I had my hubby in mind when I made this card, so I tried not to add any girly embellishments. The layout is from this weeks sketch at Tuesday Morning Sketches. I don't have a lot of decorative die cuts or framelits for the focal image, so I went with something more basic. The Flying Witches Cat image is from Sami Stamps and was colored using Copic markers. Both patterned papers are by DCWV from the Eek-a-Boo stack and I added some Frayed Burlap distress ink to the edges of the orange paper. The Trick or Treat sentiment by Stampin' Up! was stamped using Memento black ink. For the details three bats were die cut using a die by Sugar Pea Designs, the purple button came in a variety pack and the twine is from The Twinery. That's it! Cardz 4 Guyz: Button It! Wishing you a crafty day and thanks for stopping by!!! Adorable Halloween card Andrea! Love the Sami image! How did I miss this one? so cute! Thanks so much for joining us this week and using our Tuesday Morning Sketch for your wonderful card! What a super design, Andrea - the image did make me chuckle. Thanx for sharing with us at Cardz 4 Guyz. What a cute graphic -- love the bats - and the papers you selected are very cute! So cute! What a great image! You have chosen a cute image Andrea - and I like the fish tail banner with the button... quite fun! 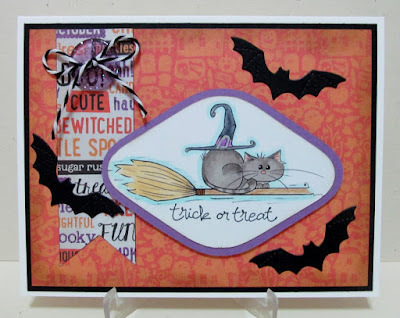 Thank you for sharing your project and creativity with us at Aud Sentiments for our Halloween Sentiment challenge! Hahaha... what a funny and cute image?! It's a perfect design with all the details - the papers, the bats, the colours. WOW!!! So so so cute!! What a great image, love Sami Stamps! The bats are such a run addition. Thanks for sharing it with us at Aud Sentiments, hope to see you soon and good luck! I really love what you did with our recipe, this is a gorgeous, funny, warm project. Thank you for joining us at Pile It On and please come back for the newest challenge.